This article is about the film. For the novel on which it was based, see Satantango (novel). 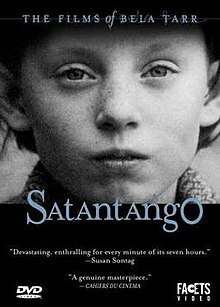 Sátántangó (Hungarian: [ˈʃaːtaːntɒŋɡoː]; meaning 'Satan's Tango') is a 1994 Hungarian art drama film directed by Béla Tarr. Shot in black-and-white, it runs for more than seven hours. It is based on the novel Satantango by Hungarian novelist László Krasznahorkai, who had been providing Tarr with stories since his 1988 film Damnation. Tarr had wanted to make the film since 1985 but was unable to proceed with the production due to the strict political environment in Hungary. In the years since its release, Sátántangó has received wide acclaim from film critics, and is considered one of the greatest films ever made. In 2012, it appeared in the British Film Institute's Sight & Sound critics' top 50 films. In a desolate village, after the collapse of a collective farm, Futaki is having an affair with Mrs. Schmidt (Éva Almássy Albert), as he is awakened at dawn by the ringing of church bells. Mr. Schmidt (László Lugossy) conspires with another co-worker to steal the villagers' money and flee to another part of the country. As Futaki is sneaking out of the Schmidt home, he discovers Schmidt's plans, after which he demands to become part of the scheme—all of this being watched by a lonely drunk man known as the Doctor (Peter Berling), who writes the events down in a notebook. However, the conspiracy is terminated when rumors spread across the village that the charismatic and manipulative Irimiás (Mihály Vig), a former co-worker who had been presumed dead, is returning. Meanwhile, Irimiás and his friend Petrina (Putyi Horváth) make a secret deal with a Police Captain in a nearby city, to spy on the community. At the village, the Doctor discovers he has run out of fruit brandy. Unaccustomed to abandoning his house, he decides to go out to buy liquor nonetheless. Outside, he is met with hostile weather and the arrival of the night. After purchasing his brandy, he is approached by Estike (Erika Bók), a young girl who desperately reaches out for his help. Behaving aggressively towards the child, the Doctor reconsiders and naively tries to apologize as the girl leaves and disappears in the darkness. Chasing after her, the Doctor passes out, and collapses in nearby woods, and is found in the morning by the town's conductor who takes him to a hospital. The morning before the Doctor left his house, Estike is tricked by her brother, Sanyi (András Bodnár), into planting a "money tree" somewhere in the wasteland. She tortures and poisons her cat to demonstrate that she has some control over something in her life. After finding out she has been deceived by her brother and trying in vain to recover her money, she succumbs to silent despair, devastated by what she's done to her pet. Dangerously marauding in the woods, the girl approaches the local bar, and peers through its window, where most of the villagers dance to accordion music, unaware of the child's voyeurism. Afterwards, she encounters the Doctor and cries out for his help to save her cat. Rebuffed, she retreats into an abandoned ruin and poisons herself. The following day, Irimiás arrives at the village while Estike's funeral is being held. Filled with grief, Irimiás speaks to the villagers hatefully and convinces them of handing him the money of their proposed venture in order to start a new collective farm in another city. The villagers travel together to a distant abandoned building, where they collapse into sleep and have intense nightmares. Meanwhile, Irimiás and Petrina meet with an accomplice in a nearby city to acquire explosives, for reasons never explicitly explained. The next day, Irimiás tells the villagers that the plan to establish a new farm has been delayed and that their only hope of establishing a farm is to scatter around the country for an unspecified amount of time. Schmidt and Kráner (János Derzsi) demand Irimiás return their money. Irimiás agrees, but upon expressing his disapproval at their lack of trust, the villagers shamefully return the money. After traveling in a truck to the city, each of the villagers is assigned a different task by Irimiás and dismissed, except for Futaki, who tells Irimiás that he would rather get a job as a watchman, and leaves on his own. Government officials receive Irimiás' report detailing the villagers' descriptions, abilities and defects, and decide to re-write it in a more bureaucratically friendly way before filing it away and leaving for home. The Doctor returns home several weeks later, unaware that Irimiás had taken the entire community with him. As he sits down to write some notes, the same bells that woke Futaki up start ringing. The Doctor decides to leave his house once more to investigate the ruined church where the closest bell is heard. He discovers a madman in the middle of ruins desperately ringing the bells and shouting that Turks are coming. Frightened, the Doctor returns home, muttering nihilistic thoughts. The bells keep on ringing as he covers his windows with boards, completely submerging himself in darkness as he writes the narration that began the film. The film is composed of long takes, a trait found in Tarr's work. Tarr's adoption of this style has led many people to draw parallels between Tarr and Andrei Tarkovsky, both of whom opted to let their films play out at a more meditative pace. According to Tarr himself, there are roughly only 150 shots in the entire film. Many shots last up to nearly 10–11 minutes, such as several dance sequences, during which the camera rarely moves, but we see the main characters dance and drink. Tarr has said that the cast was actually drunk during these scenes. The opening shot, in which the camera tracks alongside a herd of cows, lasts nearly 8 minutes. There are shots depicting main characters walking (and talking) for minutes at a time, unimpeded by a cut. Whereas films that feature long takes usually have many short takes to offset the long ones, this film does not. No, we never use the script. We just write it for the foundations and the producers and we use it when looking for the money. The pre-production is a very simple thing. It takes always a minimum of one year. We spend a year looking all around and we see everything. We have a story but I think the story is only a little part of the whole movie. An omniscient narrator can be heard at several points throughout the film, textually quoting parts of the novel. It also adapts every single one of the moments in the book, leaving nothing out. Mihály Víg, who plays Irimiás in the film, was Béla Tarr's film composer since working on Almanac of Fall in 1984, until the director's retirement in 2011 with the film The Turin Horse. Tarr has described his collaboration with Víg, as well as that with his wife and editor Ágnes Hranitzky and cinematographer Fred Kelemen, as "collaborative filmmaking", in which each one of their individual works stands as a relevant production of its own. As with Damnation (1987) and all of Tarr's work since 1994, Sátántangó utilizes a small set of original compositions by Víg that play at strategic points of the film, to establish connections between themes or situations. For Sátántangó, Víg composed a type of score that has been described as "carnivalesque" by Tim Brayton. It is composed of melancholic and haunting accordion themes, reminiscent of a slow and repetitive tango. The most prominent musical theme of the film is "Rain II", which is featured at most of the film's signature moments. Three tango suites play once at separate moments of the film, "Galicia" and "May I Have This Tango?" in "The Job of the Spider II"—while the villagers feast as Estike watches from outside the bar—and "Circle Dance II" after the villagers arrive at the new building that is supposed to be their farm, while the camera goes through their faces and emotions. Additionally, a sound effect-like deafening tune is used as the background for the ringing of the church bells, playing constantly throughout the film. In the 2009 compilation "Music From the Films of Béla Tarr", all of the mentioned tracks appear, and the latter is listed as "Bell I" and "Bell II." As with the novel upon which it is based, Sátántangó deals with strong pessimistic philosophical themes surrounding the absence of authority, the prevalence of nihilism, and the evils of indifference. The opening shot, lasting up to 10 minutes, depicts a vast herd of cows wandering in a desolate farm and then vanishing in the distance. Although the scene is largely seen as an establishment of the area and the farm's ambient, it is often discussed that it symbolizes the outcome of the story. In the chapter "We Are Resurrected", Irimiás and Petrina broker a deal with a Captain that will lead to the inevitable death or imprisonment of the villagers. The Captain does not appear to be comfortable with the lack of empathy and sociopathic conduct of Irimiás. For this reason, the Captain delivers an extended monologue about the importance of authority, quoting Pericles on the subjects of order and freedom. Some authors have judged the figure of the captain to represent a symbol of authoritarianism during the Hungarian People's Republic. Regarding the film's most prominent theme, the character of Irimiás can be seen wielding a God-like influence over the villagers to the point of convincing them of doing anything and to make himself be greatly feared by them. In "The News is They Are Coming", Futaki and Mr. Schmidt are forced to cut off their plans to escape with the money of the village's farm as a result of Mrs. Kráner telling them of the discovery of Irimiás' return. Futaki is seen reflecting on the character of Irimiás with great fear, saying at one point "Irimiás [...] he could build a castle out of thin air, if that was his will." The divine influence of Irimiás is symbolized heavily throughout the film. In "Knowing Something", the Doctor catches a glimpse of Irimiás and his companions' arrival before he blacks out in the forest. In the three middle chapters, concerning Estike's death, the villagers burst into an impromptu feast at the tavern in fear of the approaching moment of Irimiás' arrival. Precisely because of their fright of him, as well as their inherent mistrust of their neighbours, they ignore Estike in the woods outside as she first watches from a window, proceeds to cry to the Doctor for help and subsequently kills herself. Further on, Irimiás makes use of his rhetoric to persuade the villagers to hand him all of the money they had earned at the collective farm, pledging them the guilt of Estike's death. In many scenes, Irimiás appears as a knowledgeable and worldly person capable of manipulating the villagers, but also fearful of people less naive, such as the Captain and, to an extent, Futaki. Repressed fear of true authority from Irimiás can also be seen in "Going to Heaven? Having Nightmares? ", when he encounters the ruins where Estike committed suicide. While he is ignorant of the event that took place in the ruins, Irimiás nonetheless bows before them, almost instinctively, as an acknowledgement. The fact that the villagers are aware that they have lost all prospects of stability, but are still willing to follow Irimiás due to his leadership, place him in the position of an archetypical False Prophet, with more diabolical traits to him than properly divine ones. Similarly, the character of the Doctor wields an important symbolic side of the film's themes. Appearing as man of culture and developed interests, the old Doctor is past the point of disillusion of his village, staying indoors most of the time and behaving antisocially. The Doctor only agrees to go out after finding out he has run out of brandy, and his choice is deeply regretted when he is met with hostile weather under the cover of darkness and collapses. In "The Perspective From the Front", the villagers remember they have left the Doctor in the desolate village—although he was in the hospital—and Futaki's suggestion is that they leave him behind "to starve." The Doctor seems to be deprived of the villagers' indifference, in spite of his hostile behavior towards Mrs. Kráner, willing to help Estike before she committed suicide and disturbed enough to investigate the ringing of the bells in "The Circle Closes." Out of the entirety of the village's inhabitants, the Doctor seems to be the only one willing to accept death, as he chooses to starve himself in the abandoned village rather than following Irimiás. Sátántangó has garnered virtually unanimous acclaim from critics since its 1994 release, and grew in reputation among American art house circles following the release of the director-approved 2006 DVD from Facets Video. It currently has a 100% approval rating at Rotten Tomatoes, with Tarr's direction being a frequent subject of praise. Ed Halter called Tarr "one of filmdom's criminally undersung geniuses"; in referencing the film's ominous and illusory tones, Halter wrote, "Tarr's overwhelmingly bleak oeuvre makes Robert Bresson seem like an upbeat party animal by comparison." In The New York Times, Manohla Dargis lauded the director's use of long takes. J. Hoberman of The Village Voice described it as "one of the great, largely unseeable movies of the last dozen years," and Jonathan Rosenbaum of the Chicago Reader has called the film his favorite of the 1990s. Susan Sontag described Sátántangó as "devastating, enthralling for every minute of its seven hours," adding she would be "glad to see it every year for the rest of [her] life." In the 2012 Sight & Sound critics' poll of the greatest films ever made, the film tied for 36th place, with 34 critics having voted for it. The film has developed a cult following among certain audiences - in part due to its artistry and length, but also its long-time lack of availability on DVD. The film was only briefly out in VHS and DVD formats in the 1990s, and went out of print very quickly, initiating a period in which only bootlegs transferred from old VHS sources were available. It has since been released in a new transfer supervised by Tarr. Rarely screened in movie theaters due to its lengthy running time, theaters generally show Sátántangó either in two separate parts, or in its entirety with two intermissions. Tarr has expressed a wish for the film to be viewed without any interruption. The scene in "Comes Unstitched" when Estike (Erika Bók) kills her cat led to some difficulties in getting the film shown in the United Kingdom, due to legislation protecting animals from cruelty and the British Board of Film Classification refusing to certify such films. Tarr has insisted that there was a veterinarian on the set at all times, and that the cat was under the vet's supervision. ^ "Interview with Béla Tarr: About Werckmeister Harmonies (Cannes 2000, Director's Fortnight) - Bright Lights Film Journal". Bright Lights Film Journal. Retrieved 14 March 2016. ^ Jonathan Romney (24 March 2001). "Interview: Bela Tarr, Hungarian director". The Guardian. London. Retrieved 4 August 2013. ^ a b c Jacques Rancière (24 March 2013). "Book: Béla Tarr, The Time After". University of Minnesota Press. Minnesota. Retrieved 31 March 2015. ^ "Sátántangó (Satan's Tango)". rottentomatoes.com. 8 February 1994. Retrieved 14 March 2016. ^  "Finding Beauty in the Miserable and the Mundane"
^  "Bela Tarr's Marathon Masterpiece Casts a Devilish Spell"
^ "Critics' Top 250 Films". Sight & Sound Greatest Films. British Film Institute. 2012. Retrieved 12 September 2012. ^ Romney, Jonathan (24 March 2001). "Out of the shadows (interview with the director)". The Guardian. London. This page was last edited on 22 April 2019, at 06:11 (UTC).